This is a rather lengthy page. Let me draw your attention to two modules that worked quite well. These "lesson plans" happened to be mine. However, I am sure their success was largely due to their masterful implementation by Brian Meter. As a gentle introduction to the idea of writing a program on a laptop and transferring the program to run on the yellow LEGO Mindstorms brick, we used the music playing capabilities of the brick. This exercise requires no assembly time. This exercise is easier to do with with NQC and the Bricx Command Center (with its piano player) than with RCX or Robolab code. The musical concept that a note has both pitch and duration is introduced. Since the Mindstorms firmware hands off the actual playing of the note to another process and continues on, the concepts of queues and multitasking can be introduced while arranging pauses between notes. The following is a series of approximately 1 hour units of camp activity. The theme is that of the LEGO Mindstorms kit. That is, to have fun while moving from "playing with LEGOs" to building and programming autonomous robots. This list is beginning in outline form and can be expanded. I will be happy to add requested topics and comments from campers and camp teachers. This is intended for a camp of about 15 hours over 1 week. There would be about 10 campers and 5 computers and 5 LEGO Mindstorms kits. Some of these depend on other units and some depend on mathematics learned in regular classes. During our preparation for Robofest 2005 workshops, we needed to focus on programming a rather vanilla robot. The most frequent request I received was, "When can we learn more about building?" When Papert wrote Logo, more than a quarter century ago, it was of course text based. He showed that 4th graders could easily use his language. A "well-written, uncommented program" is an oxymoron. Comments and making your program readable and understandable for other people is harder with icon based programming. Hard enough that icon programmers usually never learn this important communication skill. Writing a program plan in programming language independent text (pseudo-code) does take some time and practice. Many of our university students still do not understand that skipping this step wastes even more time during debugging. RoboLab is an extra cost item. NQC is free on Windows, Linux and Mac. NQC is still in active development and RCX Code is not. On some Windows laptops, the sleep mode can disrupt the IR tower communications so that the computer needs to be rebooted. The NQC IR tower driver is more up to date and seems less prone to this source of teacher and camper frustration. Dr. Chung has found that young children, new to the LEGO Mindstorms system, learn the icon based RCX Code quickly and easily. To give campers with some LEGO experience, a headstart on the next Robofest, consider NQC. As a programming judge, I often heard the most positive remarks about text based programming from participants in their second or third Robofest. These young programmers usually had tried icon based programming first and then appreciated the greater control and power of the text based language. Introductions. The steady upward trends: not the population of Detroit, not MEAP scores, but the number of computer controlled systems in cars. Radio control toys versus autonomous robots. The ideas of sensors, decision making and multitasking. A car with a human driver encounters a slower car ahead. A car with a computer driver encounters a slower car ahead. The idea of cross platform development. Writing your program on a laptop computer and translating it to instructions your robot can understand. Perhaps a demo with a prebuilt robot and a simple "go forward" program. Then make a square, etc. A demo with a prebuilt robot would help. You could also use Logo. See Brian Harvey's Home Page, www.cs.berkeley.edu/~bh/. A challenge to spell LEGO in axles. Playing music with the RCX brick. This could be a 1 hour or 1 day session. This is an opportunity to introduce programming without any mechanical or construction distractions. The RCX brick can be combined with other musical voices. Expect absolutely no musical help from me. The LEGO unit of measure. The 3-4-5 triangle and bracing and locking. Sturdy construction with locked squares and triangles. Getting the holes in the beams to line up so pegs fit. A challenge to make the smallest possible locked square with just beams and plates and pegs. LEGO gears and pulleys. Changing speed with gears. Changing direction with idler gears. Power and gear ratio. Gears need nearly exact spacing to mesh. A pulley and belt system is more forgiving. LEGO motors. Programming speed, direction and braking. Motors and generators. An unconnected motor. A motor connected by a wire to another motor. A motor connected to itself by a reversed wire. Mounting motors. Those little 1 x 2 plates with the tabs. Worm gears, bevel gears and rack gears. A crane with 1 motor that lifts a load. Stop the lifting with braking and then with coasting. Adding push button controls to the crane with touch sensors. Gears and power lifting and speed lifting with the crane. Using two motors together for more power. A robot with 2 motors, 1 for each driving wheel. Driving straight with the wheeled robot. Faster with gears. Driving up a ramp with the wheeled robot. Faster with gears? A straight line "drag race". Turning with the wheeled robot. The passive light sensor. Turn to a flashlight. Easy decision making. Staying "in the spotlight". Not so easy. The active light sensor. Follow a line. A Race around an oval black line. A simple maze made out of lines. Following one "wall" with the light sensor. The touch sensor. Stop at a wood block wall. Building a 2 position (open, closed) hand. Grabbing an aluminum beverage can. Robot to Robot communication with IR messages. A relay race with an IR message baton..
A relay race with an aluminum beverage can baton. Not so easy. Robot 1, with a touch senor, finds an obstacle and tells Robot 2, without a touch sensor, how to avoid the obstacle. A secret code. A guessing game strategy for code breaking. A "parking lot" gate or an automatic garage door opener. Using a touch sensor or IR message. Sorting Tic-Tacs and Necco Wafers on a LEGO tread conveyor belt. Not so easy. If you are new to the LEGO Mindstorms kit you might want to read over What's in the box? An introduction using the 1st 3 topics. A prebuilt robot to move in a square. An experiment for digital age students -- a small, partial clock mechanism that shows the use of gears and spacers. There is a 24 tooth gear driven by a worm gear. The worm gear has a spacer between it and the back beam. In this minimal design there is no spacer on the axle in front of the worm gear, and there is only 1 side wall of beams. Notice the use of plates and 1/2 width spacers to keep the gears aligned. If the lower pulley is the minute hand, and the upper pulley is the hour hand, is the time shown 9:30 or 18:30? That is, is this a 12 or 24 hour clock? Can you set the clock back by turning the minute hand back? What additional pieces would it take to allow this? Can you turn the minute hand by turning the hour hand forward or backward? An introduction to programming using the music topic. An introduction to construction using topics 5, 6 and 7 followed by making a 2 motor robot. Go forward. Turning the robot from Day 3. Adding a line following sensor. Making decisions and following a line. 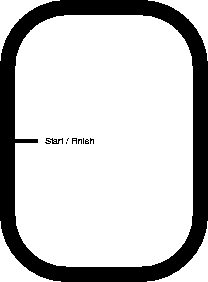 A race around an oval black line. You can make an oval out of black electrical tape. Or you can take this tiny file oval.ps to any Fedex-Kinko's with a large format, Postscript printer. This file is for 36 inch wide paper rolls (cut sheet paper sizes: c0, isob0, a0 or archE), but is easily changed with a text editor like NotePad. This printed oval line is wider and a little easier for beginning programmers to follow than the electrical tape. Make sure you have enough available electrical outlets and spare AA batteries. Most laptop batteries will not last 3 hours. RCX 2.0 bricks do not have a place to plug in a power adapter and so will likely need at least 1 change of batteries in 15 hours of camp. Internet access and a projector would be a help. You will need some administrative access to your laptop computers, so that you can install the needed software. Install the RCX software from the CD-ROM in the Mindstorms kit. Install NQC with the version of the Bricx Command Center for your operating system. Practice a little construction with the LEGO Mindstorms "Contructopedia". Try some programming by doing one of the many available tutorials.